Happy Memorial Day!!!! What a wonderful day- a day set aside to remember those who have done so much for us, and contributed their entire lives so that we are able to live in this AMAZING country. Hats off to all of them, I am truly grateful for each and every one. Also, can we say it YET!?! S u m m e r.
There, I said it. I had to. Just. could. not. help. myself. Memorial Day is kinda the official, unofficial kick off to summer. It’s when camping season starts, barbeques get pulled out of the garage, flip flops get dusted off, and we all get into summer mode. Yee-haw! I know I am READY. Ahhhh, the sweet sounds, sights and smells of summer. Sun-tan lotion, kids playing outside, boats on the water, open windows, fans whirling; it’s all so delightful. One of the best ways to get into summer mode is to shift your cooking style. No more rich soups, stews and hearty casseroles. Time to switch it up! Light, refreshing, seasonal, all the things that summer represents. Sticking with that theme, I introduce to you….one of my all-time favorite summer recipes. Whether you are barbecuing at a big backyard celebration today, or just enjoying ‘Meatless Mondays’, this recipe has your name on it. It is so versatile, so fresh, so crowd pleasing, and just plain delicious. 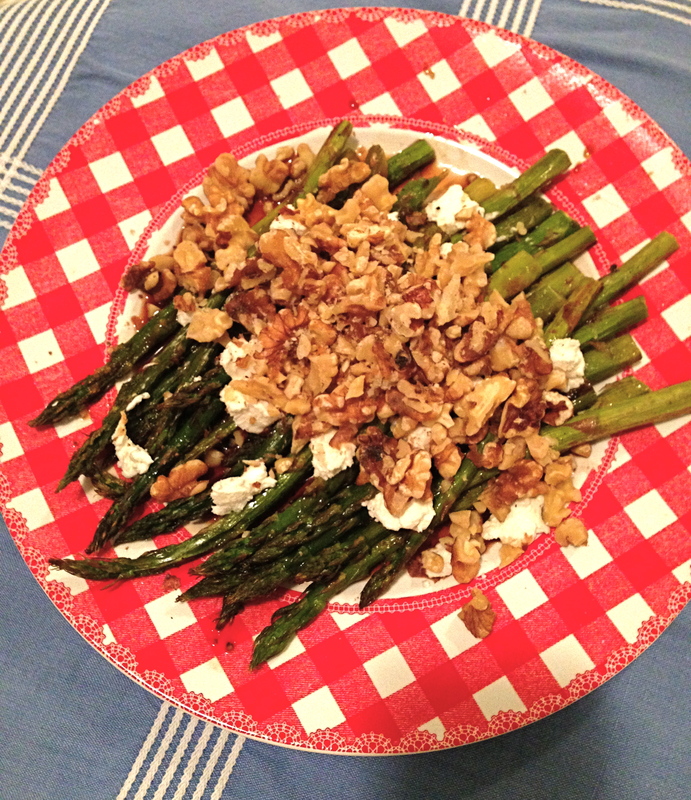 It is roasted asparagus with balsamic vinegar, goat cheese, and walnuts. 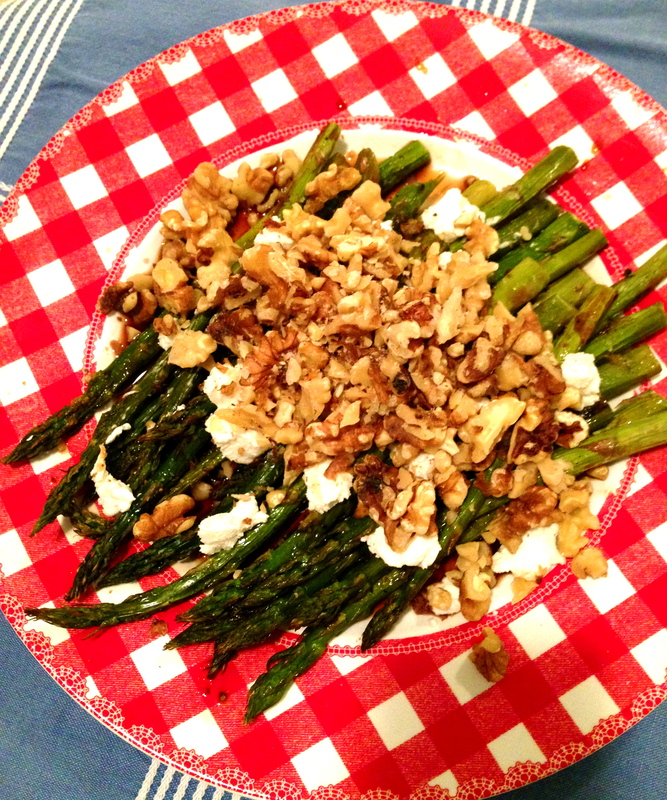 The sweet and tender asparagus pairs so well with the tangy, creamy flavor of the goat cheese, and those omega-rich walnuts add the perfect crunch and nuttiness to leave you taste buds tantalized. Roast it on your grill or in your oven- whatever floats your boat. This recipe is perfectly paired as a side dish with your steak, and great as a main entree as well. Asparagus season is in full swing, so take advantage! Let’s get cookin’! -Trim the ends of asparagus. 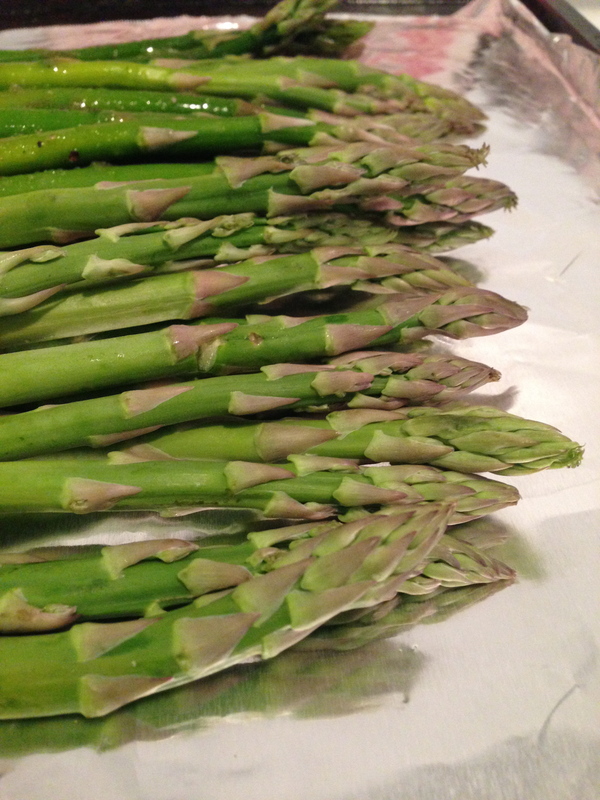 There is a natural breaking point between the edible portion of the asparagus and the white, unripe portion. Hold the end of the stalk firmly and gently bend the stalk until it breaks. Line up the rest of the stalks and cut in uniform with the one you broke. Lay pieces flat on foil lined baking sheet. 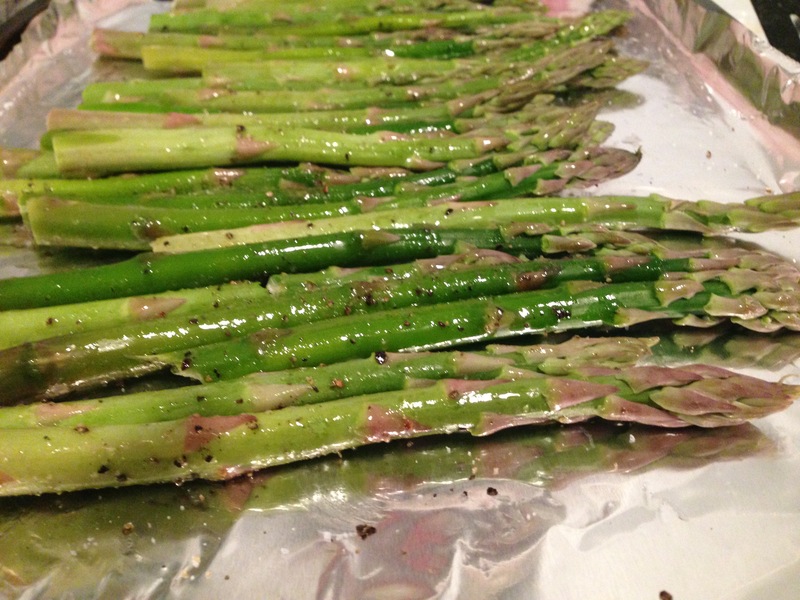 -Toss asparagus in olives, salt and pepper. Put into oven and set timer to 10 minutes. 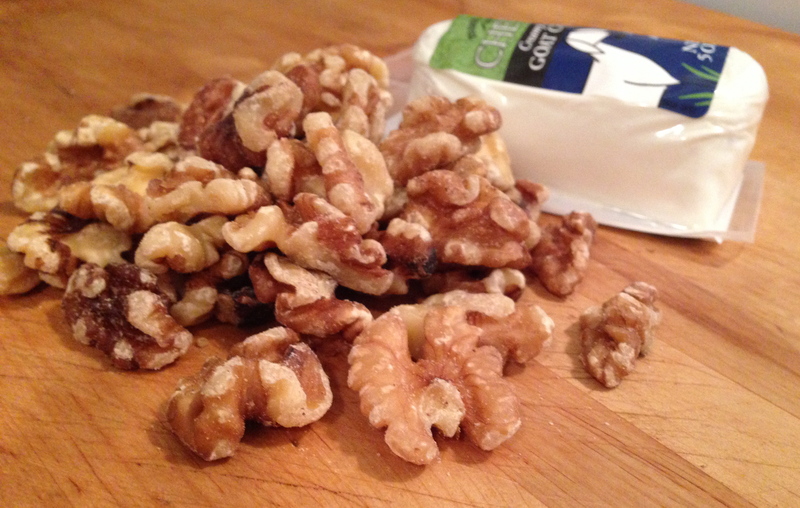 -Gather 1/4 cup walnuts and 2 ounces of goat cheese. 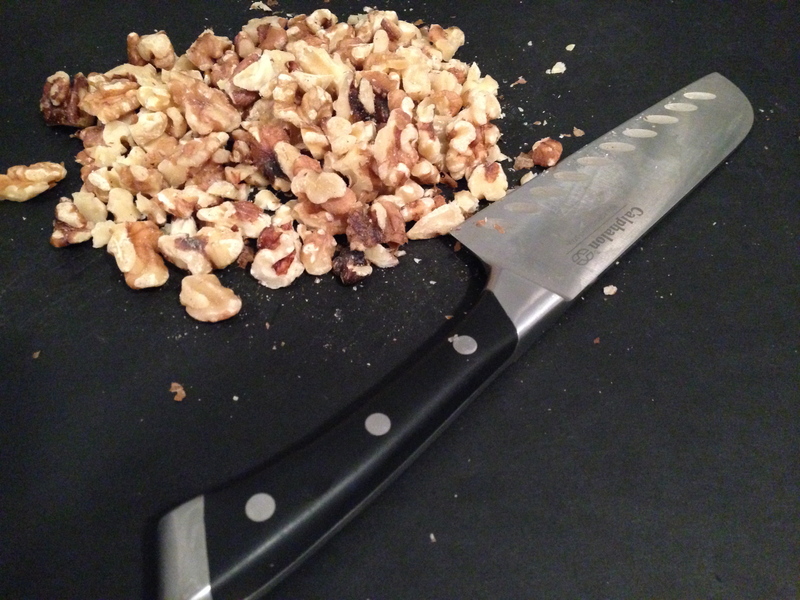 Heat the walnuts in a dry skillet over medium heat for about 3 minutes, just to crisp em up and give them that perfect crunch. Set aside, allow to cool, and then give them a rough chop. By now, your timer has probably gone off, so grab those tender stalks, and allow to cool for 5 minutes. The thing I love about roasting asparagus at a high heat for a short amount of time is that it maintains its crisp texture. None of that soggy, stringy asparagus. Just plump, firm delectable goodness. 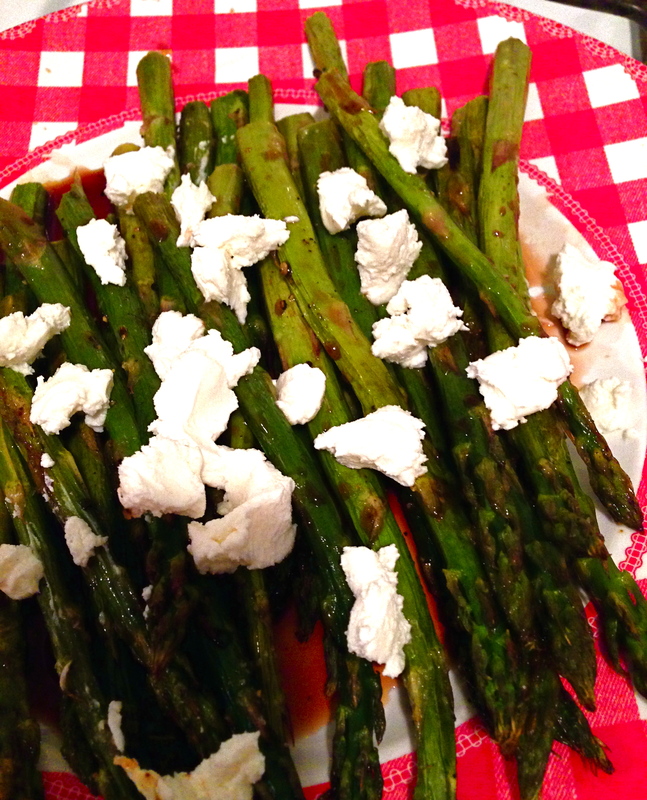 -Plate your asparagus and drizzle with balsamic vinegar, then top with crumbled goat cheese. -Spread the chopped walnuts on top. There you have it! Serve warm, and pair with a crisp glass of white wine. Bon appetit! I hope you can add this recipe to your Memorial Day festivities or file it away for a future fare! I wish you all a wonderful day of celebrating, bbqing, enjoying and remembering. Aaaaaand, a great officially unofficial first day of summer! 1 Comment on Happy Memorial Day! Lael, you have to make this on Saturday!!!!! Sunsoaked Laundry is a little corner for those with one foot in a concrete jungle and a heart set in the country. 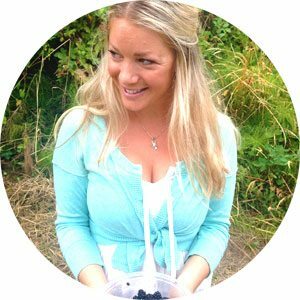 It pulls together the celebration of life, adventures and the simple pleasures, a chance to escape for a moment and soak it all in.